Do you want to hike the famous pilgrimage trail, the 500 mile/800 km Camino Frances in Spain, but don’t have 30+ days for that trek? Or are you terrified of the fitness, research, and planning that is required? The Camino Ingles is the answer! The Camino Ingles is one of the Northern Caminos, a great doable walking adventure for anyone of moderate fitness. 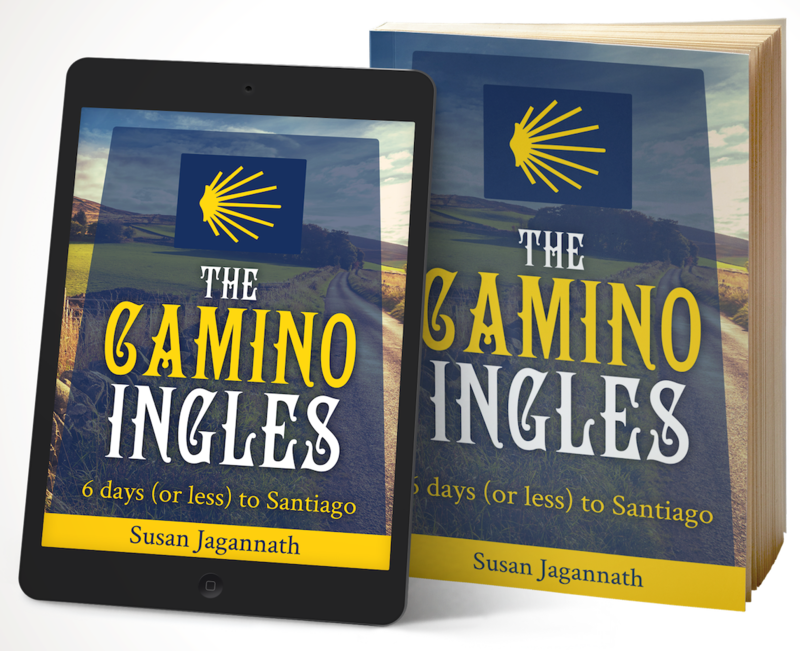 You may have heard of “the Camino”, but there are many Caminos, and the “English Way” or Camino Ingles is one of them. Follow this book to complete a real pilgrimage trek in only 6 days, there is enough detail to guide you each day. Go on, what’s stopping you? It’s only one step at a time! “My mum has done the traditional “cheating Brit” camino (driving from Santander to Santiago, stopping to cherry-pick a few scenic spots to actually walk). I lack her excuse of needing a cane to walk) but the Frances is both unrealistic to cram into a wage-slave holiday, and probably beyond my deskbound fitness level. 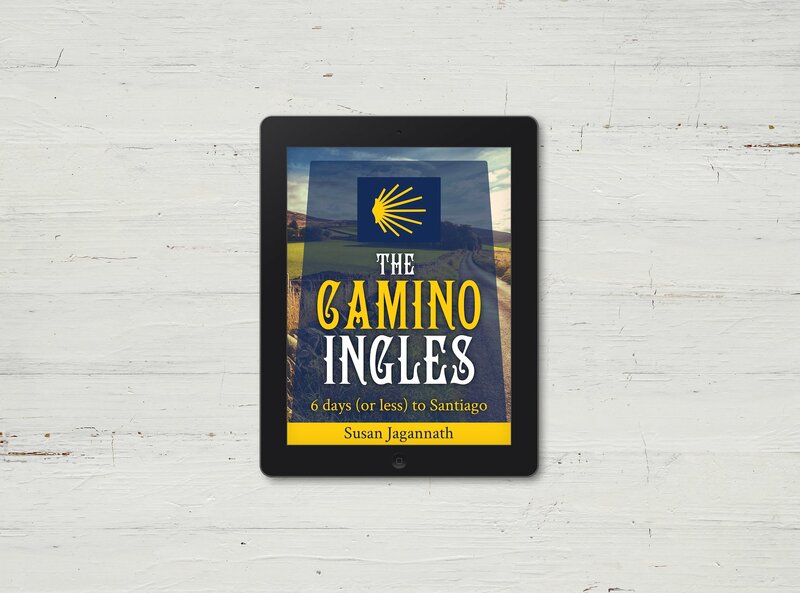 The most authoritative, short book on the Camino Ingles! Laid out the journey in easy-to-understand steps including illustrations of the route each day and the gradient to expect. Took what could be an overwhelming 140 kilometer trek and made it manageable by providing detailed info on training, clothing/shoes, gear to bring, finding potable water along the way, porting your backpack, where to stay/eat along the route, etc. (author said she had already done all the research for a successful pilgrimage and she meant it!) Final word – Excelente! Mr Don Kidwell, a Top 1000 reviewer in Amazon. I was expecting another spiritual journey story. Instead this is a clear guidebook to the shorter (144 km) Camino Ingles. This adventure has intrigued me, but being 60+ in poor physical condition, I wasn’t sure I could handle this. This author describes the day to day walking, but the clarity of her information gives me food for thought…maybe??? Then she explains how you can get your stuff from point A to point B without carrying it all.Yay! Carry this book as your guidebook and you won’t get lost, hungry, or cold. She says to leave your books at home, but I wouldn’t leave this one at home. It’s basically the Bible to the Camino Ingles. You’ll be happy you had this one with you.